How much does trademark cost in comparison to other things - Reggster If there is any additional information you would like us to take into account, please indicate that below.If there is any additional information you would like us to take into account, please indicate that below.If this is your first filing for this trademark, you may be entitled to protect your trademark in other countries with the same priority (application date) within 6 months.If this is your first filing for this trademark, you may be entitled to protect your trademark in other countries with the same priority (application date) within 6 months.You can claim priority if you have made an identical application for the same trademark in the last 6 months in another country. If you select "yes", we will contact you to verify whether you are eligible to claim priority (effectively an earlier application date)You can claim priority if you have made an identical application for the same trademark in the last 6 months in another country. If you select "yes", we will contact you to verify whether you are eligible to claim priority (effectively an earlier application date)If these goods and services below to other classes than chosen above, extra government fees apply. In that case we will contact you before filing the application.If these goods and services below to other classes than chosen above, extra government fees apply. In that case we will contact you before filing the application.This is only for communications between you and as. The information will not be disclosed to EU trademark office.This is only for communications between you and as. The information will not be disclosed to EU trademark office.Write here the full legal name of the applicant. The application will be filed in the name of the entity identified here. Make sure that the name is correctly written. Include the legal form (e.g. "Limited Company") in the name.Write here the full legal name of the applicant. The application will be filed in the name of the entity identified here. Make sure that the name is correctly written. Include the legal form (e.g. "Limited Company") in the name. 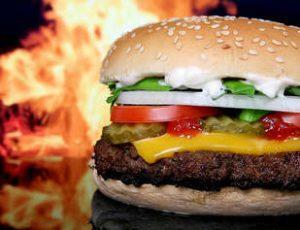 Too many companies decide not to protect their trademarks because of cost reasons. Here are some calculations and comparisons how much an EU trademark costs. The calculations are based on the registration covering 3 trademark classes (government fee 1050 EUR) and having been filed on Reggster (attorney fee 395 EUR). So the total cost of the trademark is 1445 EUR. ​So the monthly cost of maintaining EU trademark rights (attorney fee included), is about 12 EUR. Considering that trademark protection reduced business risks and increases the company’s value, it does not seem like a big investment. 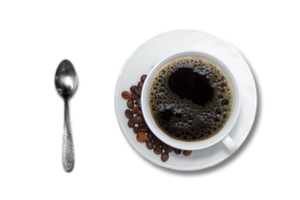 How does trademark cost compare to other goods and services? In comparison to other costs, having a solid trademark protection is not particularly expensive. 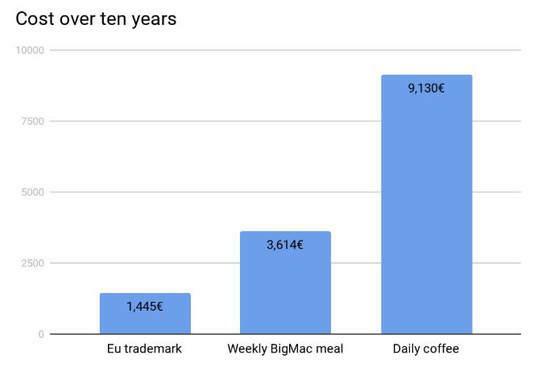 Here a final chart comparing trademark costs to coffee and BigMac meals.